I’ve made it past the edging chart and am at the beginning of a long serious of garter stitch, but I love how the Emily Dickinson pattern is knitting up in the silk. The beads don’t show up well in this quick-n-dirty photo but in person they catch just the right amount of light. The Emily Dickinson is a triangle shawl knit from the lower edge up, the exact opposite of what is traditional in triangular shawl patterns. In other words, the rows are llllooooonnnnngggg to start with and decrease in length as you make your way to the top. During the first chart I didn’t bother with stitch markers to separate the repeats and allowed the beads to serve the role of markers. As long as a knitter pays attention it’s easy enough to make sure the chart lines up using this method. For the first few rows I used my Denise needles, which really had too much grip for the silk. Silk needs to slide and glide on the needles. Not off the needles but smoothly along especially on long rows of garter stitch I’ve discovered. After the first chart I switched to wood, Lantern Moon needles to be specific. They provide a nice glide, the tips are sharp, and the color of the wooden tips is fine with the chestnut brown silk. 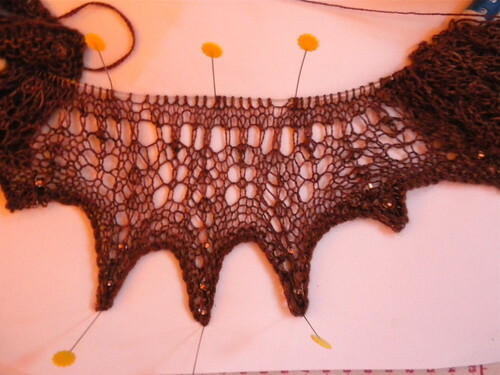 Thus far – I’m truly enjoying this shawl. It’s such a nice easy knit I’m having a hard time putting it down whenever I pick it up. PreviousPrevious post:Fleece to yarnNextNext post:Color, yarn and the local-vore connections.